The Nissan Pulsar SSS sedan. 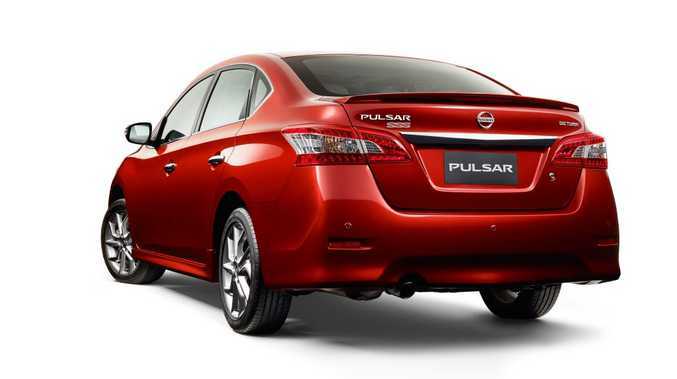 NISSAN will add a more potent SSS version to its Pulsar sedan range when the Series II models arrive later this month. Previously only available in hatch guise, the SSS variant comes armed with a 1.6-litre turbocharged petrol engine. Retail prices will start from $26,990 for the manual, and $29,290 for the automatic. The new Pulsar SSS sedan replaces the Pulsar Ti (which was priced at $29,990) and will have the same specification as well as a SSS bodykit and Rear Park Assist. Pulsar ST-L sedan gains satellite navigation with 14.7cm touch-screen, reverse camera with distance guidance lines and Bluetooth audio streaming, all while receiving a price reduction of $1200 from its retail price. Additional value has also been injected into the Pulsar hatch range, highlighted by a $3800 reduction in the manufacturer suggested retail price of the Pulsar SSS hatch. The ST-L grade gains Rear Park Assist while also receiving a price reduction of $1600. The Pulsar ST-S hatch grade has been deleted.